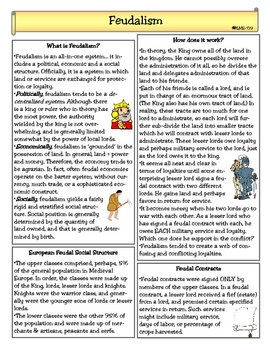 This one page reading plus one page of questions summarizes the series of events that led to the establishment of Feudalism in Western Europe. It is designed for middle school or high school students. The reading is visually appealing and broken into chunks. It can be used for classwork, homework, research or as a platform for projects. 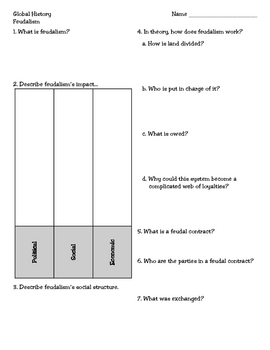 Questions are content based and designed to target essential content acquisition. If interested in similar Middle Ages readings, check other offerings by this author. A set of 7 readings is available as a Middle Ages unit (plus lesson suggestions). Feudalism in Western Europe by The Lady Lion is licensed under a Creative Commons Attribution-NonCommercial-NoDerivs 3.0 Unported License.